Study carried out on the archaeological site of Champlieu (60). RGB, PIR-GB and Thermal Infrared acquisition carried out on June 14, 2017 by the company Aeromapper with the AVEM drone. Post-processing by Drones Imaging. The Gallo-Roman ruins of Champlieu are located in the department of Oise, in the commune of Orrouy. They correspond to the visible remains of an actual city which developed from the 1st to the 4th century AD. Today one can still see and visit freely the ruins of the monumental center of the small town. It consists of a theater of 71 m in diameter, a temple and thermal baths. The remains of the city are buried under the neighboring agricultural parcels. 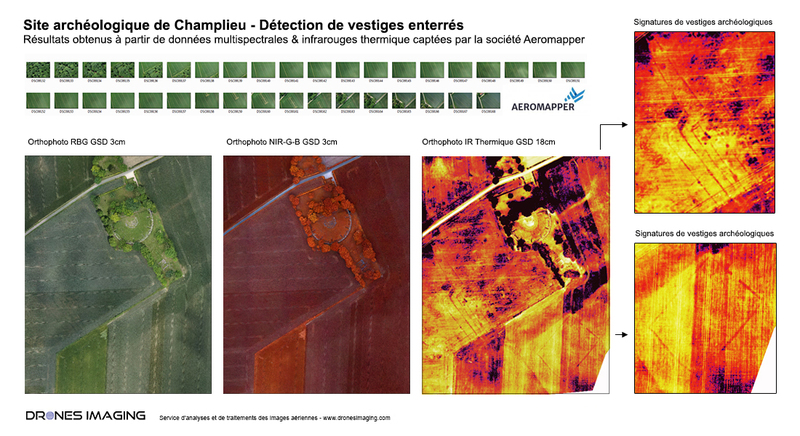 In this context, and under the impetus of the Department of Archeology of the Oise (SDAO), the operation of Aeromapper’s AVEM drone and its three dedicated sensors (RGB, PIR-GB and thermal infrared) was to provide to archeologists an overview of the site, and to help in guiding and optimizing their research as well as completing the city’s maps. Following the June 14, 2017 flight campaign and after images exploitation by the company Drones Imaging, thermal infrared photography immediately revealed linear photographic signatures that are characteristic of old constructions or ditches, which are invisible on RGB and PIR-GB data. These images confirm the existence of already partially known urban planning elements and reveal other unknown elements. « Aeromapper’s AVEM renews the techniques of aerial archaeological prospection considerably by the flexibility of its use, the speed of intervention, the vertical shooting, the diversification of its sensors … Many assets which open up new perspectives for our research » considers the SDAO. Encouraged by these first discoveries, future drone operations are then envisaged before the end of the year to study the neighboring lands in similar conditions of hygrometry and temperatures. For the SDAO, these operations illustrate the important role of drones in scientific research and also highlight the performance of the AVEM drone for its endurance and multi-sensor carrying capacity. Post processing : Drones Imaging. Temperature scale : -1°C / +16°C. Orthophoto : GSD 3cm & 18cm. Founded in 2012, Aeromapper is a leading UAV manufacturer based in the Paris area, France. The company specializes in industrial network monitoring, as well as large scale survey operations. Their product, the AVEM, is BVLOS certified and is capable of handling 2000ha of survey per day at centimetric resolutions. Founded in 2013 and based in the Paris area, Drones Imaging is a french leading geospatial datas provider. The company is specialized in all civilian fields through its imagery processing/analysis service but also in many military fields for the French army thanks to its ISR expertise (Intelligence Surveillance and Reconnaissance).